2 bedroom 2 bathroom townhouse measuring 90m² located on the prestigious Desert Springs Golf Resort with communal pool, roof terrace with sunroom, and amazing views of the golf course & surrounding mountains. 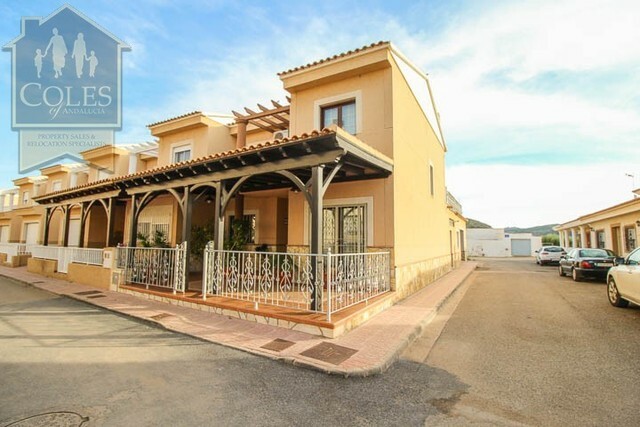 This lovely townhouse is situated on this region´s most prestigious golf & leisure resort and is a property of the highest quality with amazing views of the golf course & surrounding mountains. Entering the property, the fully fitted kitchen is on the right with granite worktops and a breakfast bar facing towards the living room. Next to the kitchen is a well-placed W/C using space that would otherwise have been wasted. In the living room you will see veranda doors looking out towards the communal courtyard with a gazebo, tables and chairs for everyone to use. A private patio has gated access directly to this courtyard, and this is a nice size with plenty of room for a table & chairs and BBQ. The living room also boasts an open fireplace, ceiling fans and air conditioning. A stunning staircase here leads up to the first floor. On the first floor there is a bathroom with shower cubicle, followed by the 2nd bedroom with A/C, fitted wardrobes and private terrace overlooking the surrounding ultivated fields and the distant sea. The master bedroom is next, again with air conditioning, fitted wardrobes and a complete en-suite bathroom with both shower cubicle and bath. The private terrace on this floor is a good size with views of the courtyard, golf course and mountains. On the next level you will find one of the key features of this property; a huge sunroom with bi-folding doors on either side which open up completely. There are terraces either side of this sunroom, and the views from here are truly breathtaking! Outside, and the path from the courtyard leads to a beautifully-kept communal pool with a grassed area and sunbeds for all to use. The pool has an infinity edge looking towards the greenery of the golf course with the Sierra Cabrera mountains as a backdrop. Desert Springs is Europe’s only world class championship desert golf course; the stunning, 72 par, USGA specification championship desert Indiana course provides a unique golfing experience. What is more its´ Golf Academy has unsurpassed facilities to aid golfers in improving all aspects of their game. It was previously the Overseas Home of The English Golf Union and is the current home of the Welsh Ladies Golf Union. The Sierra Sports and Fitness Club is located beside the famous Crocodile Club on the Desert Springs Resort. It provides a wide range of quality indoor and open-air sports and fitness facilities. Mentored by double Olympic decathlon champion, Daley Thompson, who is a villa owner at Desert Springs, it is aimed at general fitness and well-being. With warm winter conditions, which are unique to this part of Europe, it is particularly suited to pre-season general fitness, team bonding and re-habilitation after sports injuries. At Desert Springs you can enjoy a late breakfast on your terrace overlooking the Indiana, then treat yourself to a pampering massage at the Day Spa and a light healthy lunch at the Deck on Powder Creek, at the Clubhouse. After lunch a short post-prandial stroll, past the Marquee and the Cave, brings you to the Crocodile Club for a dip in the pool and a blissful afternoon nap in a semi-private sun lawn. Then home for a shower and tidy up and on to sundowners at the Cave Bar and an elegant dinner El Torrente, one of the very best restaurants in the region. Round off your evening, with a nightcap and a game of billiards in the Private Reserve.